Twenty-one year resident of Council District Four, Carolyn Ramsay is returning to Councilman Tom LaBonge’s office as chief of staff following a 15-month stint as the L.A. director of The Trust for Public Land. Ramsay worked on LaBonge’s staff for six years, first as a field deputy. She later served as communications director during a successful campaign to acquire 138 acres beside the Hollywood Sign and expand Griffith Park. As deputy chief of staff, she facilitated the development of municipal park and construction projects. “I am thrilled to return to City Hall as chief of staff, to once again roll up my sleeves and work with communities, businesses and city officials on the issues of the day,” said Ramsay. Ramsay, Windsor Square, previously worked as a newspaper and magazine reporter for 15 years, including three years as a correspondent for People Magazine. She founded Olive Branches, a nonprofit organization to raise funds to develop school gardens and landscape features in Los Angeles. 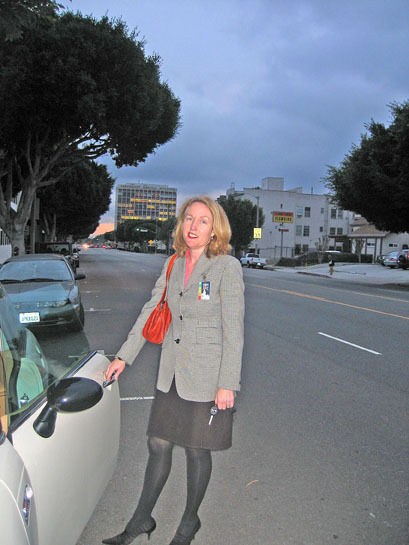 A former president of the Windsor Square Association, Ramsay served as the fund-raising chair for the Larchmont Median project. She currently serves on the board of trustees of Temple Israel of Hollywood and the advisory board of the USC Center for Sustainable Cities. Ramsay takes over as chief of staff from Jeanne Min, who has served Council District Four in a variety of capacities for more than 10 years.